i want software Urgent plz Help....??????? Discussion in 'Software Q&A' started by pr@k@sh, Aug 28, 2004.
i want to wath and controll my network data transter rate.!! u all think y i want..?? my 4 remainaing pc r using my employ..!! and in my office cable through internet and rate is per MB. so i want to watch which pc use how much data use/mb and much they down load ...!!! because my office consume 4GB of my account in last 15 Days..!! and i pay a lot.. !! plz. give me some softare ??? or which OS have a such feature...?? My dear Friends plz. it's urgent ..!! Linux has such features. You must be the Adminstatrator and others the clients. But you will have a tough time to cope up the linux commands. I recommend Red Hat Linux as support is plenty. Buy urselves a linux book to refer and study. Bandwidthd is a unix deamon for graphing the traffic generated by each machine on several configurable subnets. It is much easier to configure than mrtg, and provides significanlty more usefull information. Mrtg only tells you how much bandwidthd you are using, bandwidthd tells you that, and who is using it. Each ip address that has moved any significant volume of traffic has its own graph. 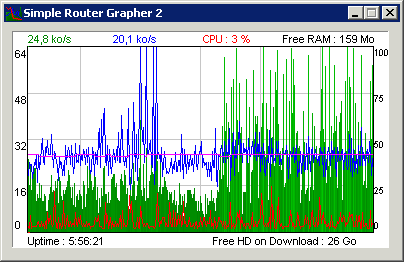 The graphs are color coded to help you figure out at a glance if your user is surfing the web, or surfing Kazaa.